Seriously, we’re not just saying that. Visiting your local Sunlite Mitre 10 store will become your favourite thing to do. Our customers walk in feeling frustrated by their dripping tap or overwhelmed by their DIY project, and leave feeling uplifted and energised. What’s our secret? We make your problems go away. We have hardware products to solve every conceivable challenge. And because we’ve been proudly locally owned since 1987, we’ve got years and years of hardware knowledge. Our in-store team members know everything there is to know about quick and easy home repairs. No problem is too big or too small. As soon as you walk into a Sunlite Mitre 10, you’ll notice it’s different here. We’re not like your average hardware store. Uplifting music, bright lighting, a wonderful range of products including big brands, and a genuinely enthusiastic and friendly team who are ready to help you. Sunlite Mitre 10 is a fun place to work and shop. We go the extra mile because we’re passionate about helping our customers. We love what we do and if we can pass on just a little of that enthusiasm to you, our customer, then we know we’ve done a great job. We strive to make your life easier and solve your problems quickly, so you can free up more time to do what you enjoy. Integrity – We are honest, trustworthy, and committed to the highest standards of professionalism. We value open, honest, and respectful communication. Team – We are a family business with strong family values. We consider everyone in the business to be an extension of the family. Dynamic – We are vibrant and innovative. We’re always ready for a challenge and we always adapt to change. Passion – We are excited about the business and our customers, and we’re motivated to be the best. Excellence – We are results-oriented and strive for excellence in everything we do. We work to our strengths and are open to learning and development. We want you to leave Sunlite Mitre 10 wondering: “When can I come back?”. We promise to give you red carpet customer service and find fast solutions to your challenges every time you visit. And if we can’t solve your problem on the spot, we’ll order in anything you need at no extra charge. We make sure that every customer who enters Sunlite Mitre 10 leaves with the highest level of satisfaction. We won’t settle for anything less. Are you looking for a retail career, not just a job? Are you passionate about hardware? Do you have incredible product knowledge – or are eager and willing to learn? Do you want to work with a locally owned business? 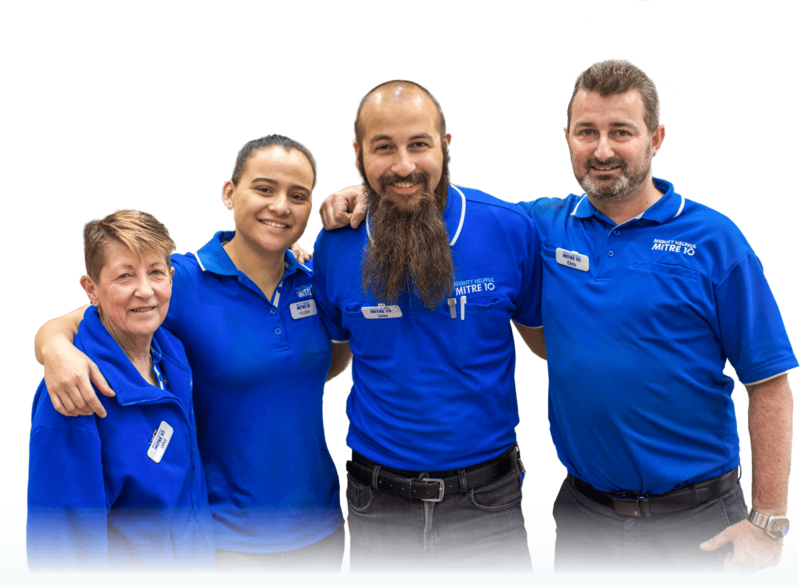 As Sydney’s leading independent hardware group, our people are the key to our success. We’re always on the lookout for talented trainees, sales assistants, and managers who are seeking a successful retail career. Due to the high volume of resumes and applications we receive, we are not able to reply to all applicants. If you share our passion and want to be part of our equation to retail success, we’d love to hear from you. * 4MB limit to each upload.